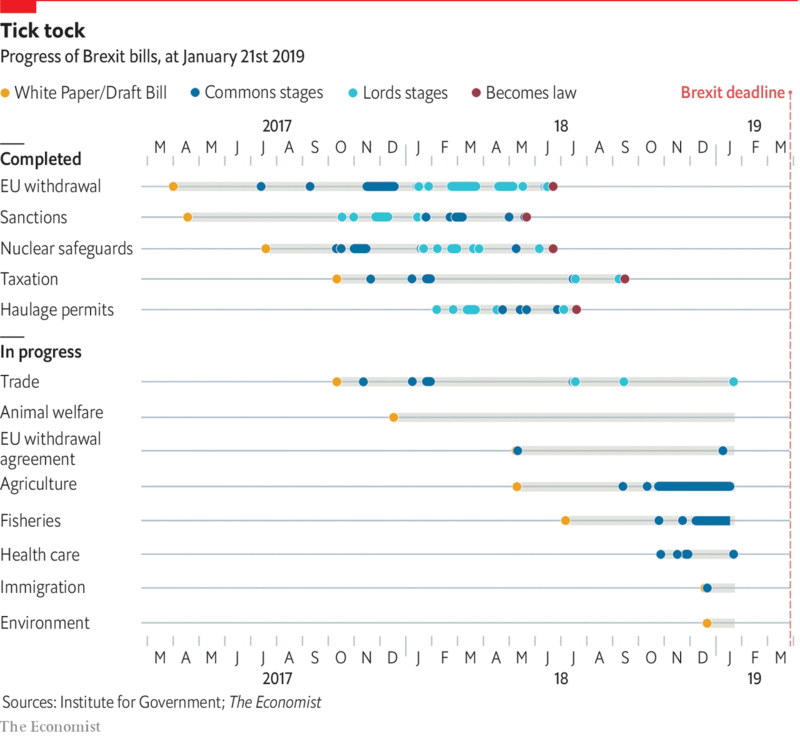 WHEN THERESA MAY’S proposed deal for departing the European Union was resoundingly defeated in Parliament on January 15th, much was made of there being just over 70 days left to find an acceptable agreement. That understates the urgency facing Britain as the March 29th deadline approaches. Counting only the days when Parliament will sit, there are now just 35 days left. Yesterday, to repeated shouts of “Nothing has changed!” from MPs, the prime minister outlined her “Plan B”. It was easy to understand the heckling. The only concrete change was an agreement to waive the £65 ($84) application fee for EU citizens who want to confirm their residency status. The rest of her statement to Parliament consisted of woolly words about giving Parliament more say, and offering the devolved assembly leaders greater involvement. With time short, and a lot of parliamentary sessions already eaten away by the failure to pass the government’s exit deal, the only ways to avoid leaving with no deal may be to request an extension of the Article 50 negotiating period or abandon Brexit altogether. Last summer, nine of the 13 pieces of primary legislation the government says are needed for any negotiated departure were yet to be made law. Today eight are still outstanding.